Four beneficiary groups in the PNG LNG project, including the Western Provincial government have finally secured the Kroton Equity option enable them to have shares in the project. According to the Managing Director of Kumul Petroleum Holdings (KPHL) Mr. Wapu Sonk, the Kroton Equity option is one of the benefits agreed upon in the Umbrella Benefit Sharing Agreement (UBSA) signed in Kokopo, East New Britain province back in 2009 and today has seen it being accomplished with the landowners signing the agreement. The Beneficiary Groups, who have exercised their Options today, have written in before the expiry of the Option date of 31st December 2016 to show their intent to exercise the Option using KPHL’s Vendor Finance. The signing of the Unit Application Form will see them now exercise their Kroton Equity Option (Options) using KPHL’s Vendor Finance. 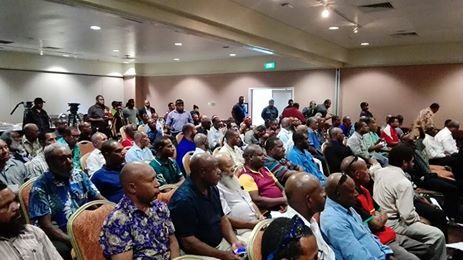 “KPHL does not want to see any Beneficiary Group to lose out on their right to acquire their interest in Kroton so the NEC endorsed KPHL to offer a safety net finance package to make sure that any Beneficiary Group who wanted to participate in an additional interest in the PNG LNG Project through a shareholding in Kroton would be able to exercise their option,” Mr Sonk added. He assured that the Board and Management of KPHL are committed to ensure that all Landowners and Provincial Governments entitled to the benefits of the Kroton Option are able to make their decision on whether or not to exercise their Option – which is a commercial arrangement entered into between the State and the Landowners – and to ensure that once exercised they receive their entitlements under the UBSA. After this signing ceremony, KPHL will work with those beneficiary groups that have signed up to complete the corporate/statutory aspect of the transaction for the beneficiary groups’ shareholding interest in Kumul Petroleum (Kroton) Limited to be registered.